Still pulling fish houses out and the colder weather has firmed the ice well. We will be letting wheel houses out starting on Monday with no restrictions. We still have a bridge out and everyone needs to drive slow everywhere (10-15mph). If you cannot drive slow, you will no longer have ice access. Fishing has been very good, much better than the press or the DNR would have you believe. The walleyes have been biting along Agate Bay Reef in 17 -20 feet. 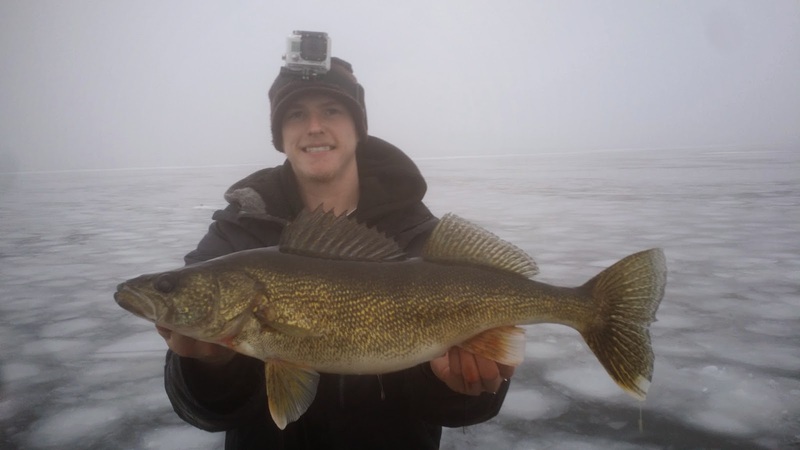 Good numbers of 20" and bigger and a lot of 2013 year class walleyes are being caught. Good catches of nice perch are also coming in 27 - 28' off Agate Bay Reef before getting to the mud. Our Perch Parkway Road goes out in this area. We will pull any private fish houses that have not gone out yet. People are driving vehicles to their houses and wheel houses are welcome. We checked the ice this morning, The ice survived well and we even got a little snow for banking. We will open our roads for private fish house customers and we will be pulling customer's fish house's out today. Drive on's with portables will be fine today. Half ton pickups with wheel house's will be ok by Saturday am. Due to the crack, 3/4 ton and 1 ton pickups with wheel houses should be ok after this weekend. Drive SLOW and save the ice. We do still have our bridge out about 1/4 mile out from shore. If you should get some good fish pictures and don't mind it we post them or use them at next year's ice fishing show please forward them to agatebay@frontier.com. It’s Tuesday am and we are temporarily closing the access, pulling houses or driving cars or trucks till Friday. There is a lot of water on the ice and it needs time to freeze. We still have 12 – 15 inches of ice and we are open to ATV traffic but we will wait for colder weather before pulling anymore houses out or driving vehicles. We hope to open the access up again on Friday but will need to go out after it get’s light out Friday am and look it. We should be open for wheel houses this weekend as well. We will post another ice update on late Friday am after we have had time to check it. The fishing this past weekend was very good. Mostly for bigger walleyes (20”–28 ½“) and 2013 year class walleyes. I also have heard of several catches of 12 – 13 inch perch. Oh yes, the infamous eel pout has made several appearances as well. 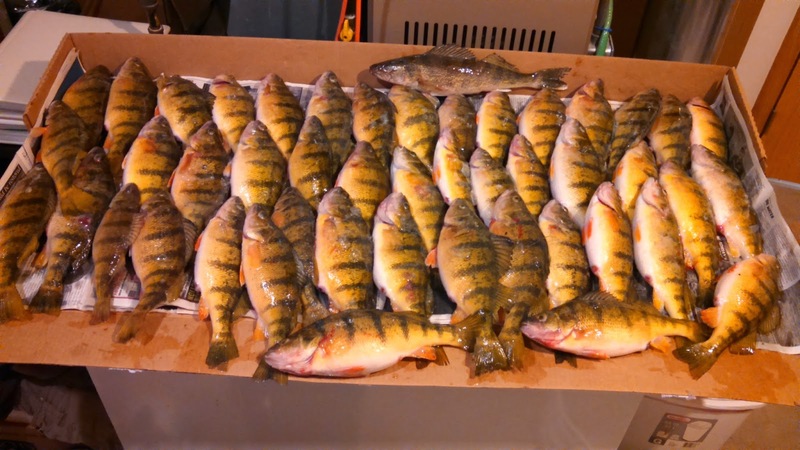 The walleyes came mostly along Agate Bay Reef in 17”–24” and the perch was in 27”–28”. It certainly was way better than last winter. Happy Holidays, Great Fishing and Be Safe! We pulled rental houses out today and it went well. The crack is still open and we bridged it. We pulled houses over the bridge. We hauled snow from shore to bank some of them but snow is hard to find. We do have rentals available for this weekend so spread the word. We will begin pulling private houses out on Friday. We now can drive to and from your house but DO NOT go exploring. We will be open for daily wheel houses and other daily accesses starting on Saturday. Since there is no snow, there are no defined roads. We left our road stakes to help, but it is definatley easier to see where to go in the daylight. If you are not familiar with our road system, it may be better for you to come at first light so you can see where you are driving. I do not have a lot of fishing reports yet, but from the reports I have heard, people are catching fish. 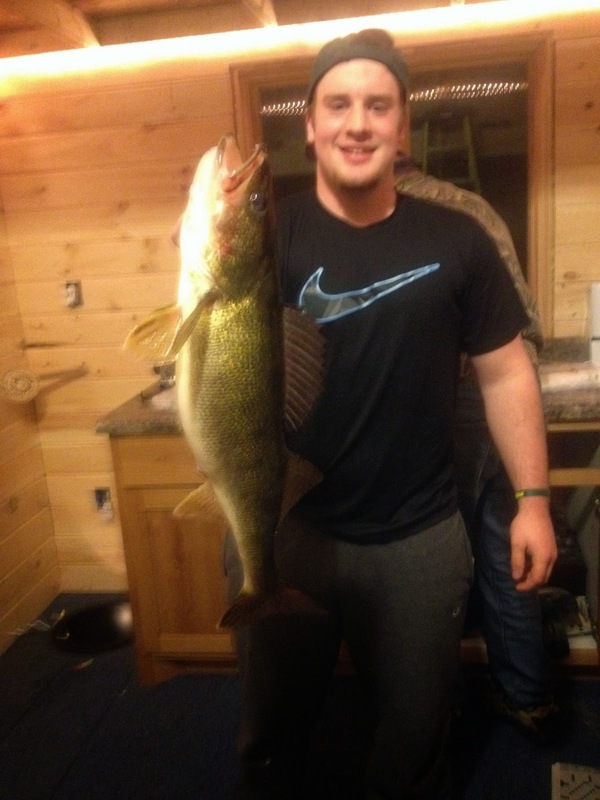 Mostly 2013 year class walleyes and bigger ones, but some slot fish as well. I also have heard of some nice northern catches. Remember to get your name on the pull list as soon as you come up and then make sure your house is ready to pull. We will get you out as soon as we can. Let the fun begin. We went out today to access the ice after the warm stretch. The water has all frozen but the crack that appeared two weeks ago is back again and is 2 feet wide and open. We filled some areas of the crack with snow and slush and will see how it freeze’s over night. On Wednesday, we will bridge the crack & go out with 4 wheelers to check the ice again in our territory. If we do not find any more cracks or questionable ice, we may try to pull some rentals over the bridge. We will see how that goes and decide on further pulling then. One thing you need to be aware of that almost all of the snow on the ice melted so banking will be a challenge. We will probably have to haul snow from shore for rentals. This means we cannot bank private fish houses for what we normally charge. It also means that banking houses will take two men away from pulling other private fish houses. We may have to bank houses during the week, rather than on the weekend, when we have people waiting to have their houses pulled. It will be a challenge and we will appreciate your patience. We will do our best to get everybody out fishing and make everyone happy. See you soon. P.S. Things to remember: Fishing License, Shelter License, FH Reflectors, FH Key, Bait (we no longer sell minnows but will have wax worms), Important - turn off propane before being pulled. We have not gained much ice since the last report. We still have mostly 12 inches with a range of 10 - 14". The crack has come back together and is only a couple of inches wide at this point. With the extremely warm temps for this weekend, we will wait to pull houses until next week. We are open for 4 wheeler and snowmobile access. Stay safe!!! Sorry for the delay in sending out an updated report. We have had access issues on our computer (I lost the password to access this blog) but Renee saved me as usual. The ice is coming very well. We have 12" in most places with some 10" further out and some 14" closer to shore. We have a crack which opened up Saturday and is about 2' wide with about 2" of ice in it. It is about 50 yards from shore. I am still undecided about pulling houses at this time. I was hoping to start this weekend but between the crack and the temperature forecast for this weekend (40 on Friday and 46 on Saturday) I am hesitating. I am waiting to see if they change the forecast and also to see if the crack heals. I will keep this updated now that Renee can post to it. This has been the most stable week we have had this year. Note, I said stable, not warm. At least, we have not had snow or high winds so for the first week this winter, we did not have to plow all of our roads and driveways. Fishing remains unchanged. It has not gotten better or worse. I think that until we get an extended warmer period, what you see is what you get. They are seeing and getting some perch in 27 - 28' and some walleyes and northern are biting along Agate Bay Reef. It is just not consistent in any area. I would like to address the new harvest quota, the DNR and the "sky is falling" attitude I hear everywhere. Last summer, after the ice finally went out, we had a decent bite on keeper fish (18 - 20") thru about the end of June. The larger fish also bit quite well thru the same time frame. Once the young of the year perch reached the size where they were good forage for the walleyes, the bite slowed dramatically. It has stayed slower all the way thru the winter. I believe this slow bite is caused by the vast numbers of small perch and, as I said earlier, the cold fronts every other day. The walleyes remain in the lake. They are just not hungry. The DNR and the band have agreed on a very low harvest quota for next year in an effort to protect the larger spawning fish and the fewer smaller fish that will enter the 14 - 18' range. They say, however, that we probably can keep the same slot regulations as what we had last year. People have reacted as if the "sky is falling" and I do not understand this. To me, we are better off than we have been for a few years. The DNR finally has addressed the problem of juvenile survival of walleyes. They have shown an appreciation of the problem and are putting time and resources to work to solve the problem. They are asking for outside help which I think is huge. When have they ever admitted that they may not have all the answers. I doubt that the solution will be easy but I have confidence that the DNR can solve it, now that they are facing the issue. In addition, I believe that there are more walleyes out there than most people think there are. The band had almost no harvest last spring and the harvest last summer was low, especially if you discount the DNR's "hooking mortality" numbers which I do. I think that is the most wild guess there is related to Mille Lacs. This winter, we have not hurt the population any. So for a whole year we have not taken a lot of walleyes, at least compared to past years. We have taken very few of the walleyes over 20" so basically, all of them are still out there. Why do we not see them or get them to bite? A LOT OF FORAGE. So many people believe the bite is dependent on the number of walleyes in the lake when really, forage availability is a much bigger factor. The walleyes do not have to concentrate on the rock piles looking for food. It is almost everywhere in the lake. For the same reason, the remaining walleyes may not have concentrated in the few areas where the DNR sets their test nets. Why should they? There is food everywhere. So... are we worse off now because we have a fantastic hatch of little perch which should protect our larger than normal, healthier than normal walleye hatch from last spring and let them grow bigger, as well as, hopefully give us a perch population to catch is 3 - 4 years? Or were we better off a few years ago when the walleyes bit like crazy because they were starving and when you caught one, their mouths were all torn up from multiple catch & releases? Are we better off now that we are a high priority for the DNR and everyone is watching them so they have some pressure to succeed? Or were we better off when no one other than Mille Lacs people seemed to care? Mille Lacs has always had ups and downs, generally in a five to seven year cycle. This is because we are a natural reproduction lake with no walleye stocking. I think this is an unusually low low but we have had some years with pretty low harvests. I think the high forage will impact the bite for a little while but the large walleyes will bite again. It will be a lot of catch & release and that is not a bad thing. If you want to have a lot of fun and help the lake, take a few hours each weekend and go catch northerns and smallmouth bass. Keep anything that is legal and cook it up. You will be surprised how good they taste and how much fun it is. It has been a while since I have updated this, but there has been little change. The wind blows and it is cold. What's new? Seriously, we now have most of the roads we usually plow. All of our rentals and most of the private houses have been out for 2-3 weeks. The roads are in good shape except they are getting way narrower than usual. The winds and drifting snow are taking their toll. Lake Street, in particular, is very narrow in a couple spots. I hope the wind and snow stop or we will have trouble getting houses off. Lake Street can not get too much narrower. The winds and drifting snow are also giving some houses problems with rising water. You may have to block the house higher or move if the water is too bad. Be sure to keep an eye on your water level both before and after you drill your holes. Fishing has been a challenge this year. We have seen some nice walleyes, just not consistently. It has been very difficult to find a pattern. We have seen walleyes caught shallower on the reef during the low light periods and also in 24-25' during the same time. The abundance of forage(little perch) does not help. Neither do the constant cold fronts coming thru every other day. 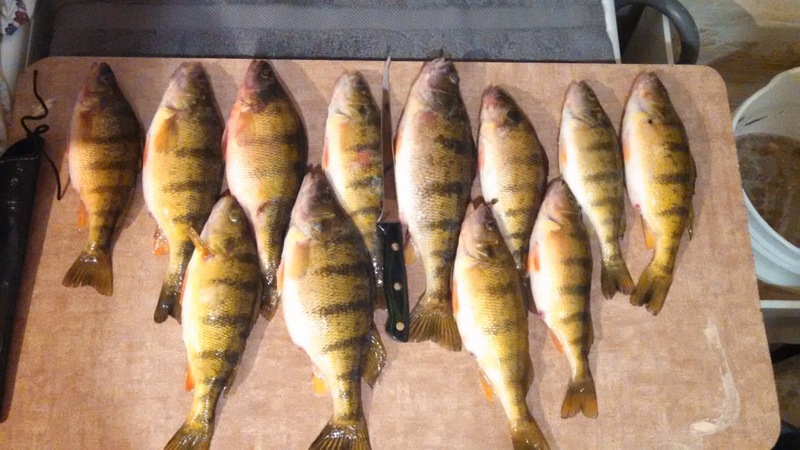 We are finally starting to see a little perch action in 27-28'. Some of them are nicer sized, along with lots of young-of-the-year perch. We moved some rentals out deeper to try to get more action. We plow spots for wheel houses in the better areas and we are open for them, along with portables. Sorry, I forgot to address portable and wheel houses. We are open for any of them as of now. We restricted them last weekend, but we are completely open for them now. Our access fee for vehicles and portables is $ 10 per vehicle per Calendar Day, not per 24 hour period or $25 for Friday- Sunday. For wheel houses on a daily basis, we require that you leave a driver's license with us to ensure that the house does not get left on the lake. The access fee is $15 per Calender Day or $40 for Friday-Sunday. For that, we will plow you a driveway to get your house off the road and we would strongly recommend that you stay on the driveways we plow. It is not a good time to go exploring off road. We have portable toilets on the lake and a very nice heated shower/toilet facility on shore which is open 24 hours per day. We also have a café on shore with excellent meals. We were able to plow Perch Parkway on Monday but there was a rough water spot out about 27-28 feet which we have stayed off of to let it freeze down. We pulled some houses out over the bad spot today and it was solid. We will pull out there and we are past the 28-31 foot break, all the way to 34 ft. in the mud. We have not plowed Tullibee Trail yet, mainly because we ran out of time and also because of the Very strong winds for tonight and especially on Thursday. It would just blow shut. I do not think we will have time to plow it on Friday because we will be plowing the other roads, doing driveways, and putting rentals in. We will get to it as soon as possible. We also plowed part of Walleye Drive. We had a road from Lake Street going southeast we called Rental B. It stopped at Walleye Drive near the south end of Agate Bay Reef. We were able to extend Walleye Drive north from that intersection about 250 yards before the snow and other problems stopped us. We will probably not plow that all the way north to our main road. If you go on Walleye Drive, you will have to go around via Lake Street to get there, at least for now. We will pull houses in there now. Going south from that intersection, we hit a very large area of water and slush which we are allowing to freeze. I believe we will be able to go south on Walleye Drive this weekend but maybe only be able to put houses on the west side of the road. There is a lot of snow and water east of Walleye Drive, especially where we normally put Flamingo Drive. We will not be putting that road where it has been in the past. We could run a road north of where it has been about 50 yards, but we will not be getting south of that. There may be a chance for a road going east quite a bit south of where the old road was in the past, but I am not sure because the water kept us from going south of the intersection yet. We have made the decision to stop carrying bait during the winter. It was a tough decision, but our minnow tank is getting old and we have quite a bit of loss due to dead minnows to the point of not making any money off bait. It is very expensive to replace our tanks and we do not see the cost/benefit to doing so. There are several bait shops in the area who do a good job. If you are coming from the south, try Rod's Bait or Johnson's Portside, both of which are in Isle. If you are coming from the north, try either Malmo Market or Westerlund's in Malmo. I know all of these people and they will treat you right. We pulled private houses since Thursday and we have quite a few out. We have had very few problems with them. There were a couple where they took on some water and we had to move them, but no more than usual. We were selective where we put houses and stayed away from areas with a lot of snow so we avoided slush. We have most of our rentals out and will get the rest out this week. Fishing picked up this weekend and there were quite a few really nice walleyes caught. Some perch are being caught in deeper water and we hope to open Perch Parkway this week. Surprisingly some small eelpout were also caught. 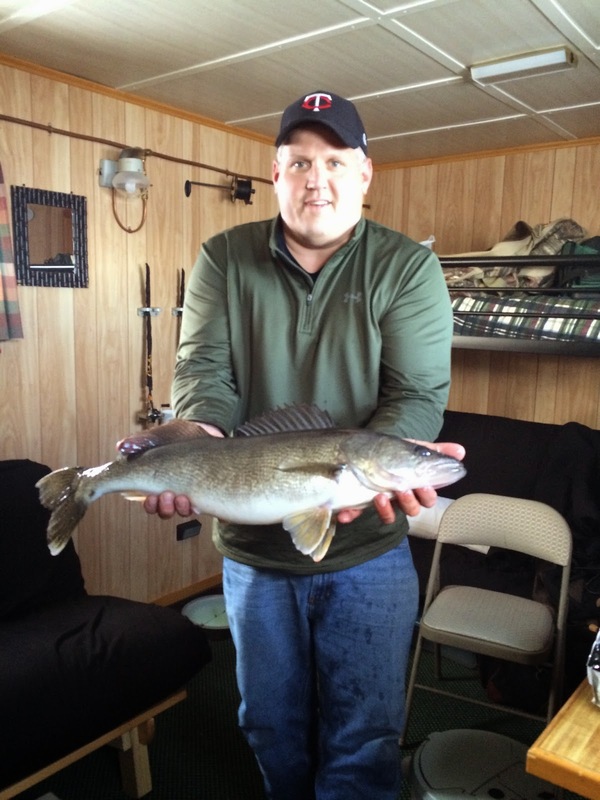 It has been a while since I have heard of any numbers of eelpout being caught. I think the warmer temps helped the fishing and now that the weather is leveling off for a while, it should continue to improve. We continue to see a large number of small perch which are this year's hatch. The numbers are really big and it is a great sign for the future of the lake. It will slow the bite for this year, but it is exactly what we need to improve the fishing in Mille Lacs. We restricted drive-ons and wheel houses this weekend to make sure that all of our private houses had room. We have now opened the resort to portables and wheel houses without restrictions, except for staying on the roads and not drilling holes in the roads. If you are accessing the lake with a wheel house and you are taking the daily rate, rather than the season package, we require that you leave a driver's license to ensure that the house comes off when you leave. We have done this for many years. We are open and going well. Our roads have been open for quite a while and have frozen down and we are starting to catch some nice fish. If you have a house here, come up and get it out and if you are looking for a rental, call and reserve it soon. The rentals are filling up quickly. We had blown the snow off Lake Street before the Deep Freeze so it froze down quite well. We also pulled houses on Archers Ave on Saturday and Sunday morning without any problems and people drove to and from their houses. I put a few rentals out for the weekend and they were on good ice. Today we plowed Lake Street and it has frozen down well, at least on the road. We also plowed driveways off Lake Street and we will let them freeze down until Thursday, when we will begin pulling private houses along Lake Street. We do not have Walleye Drive or Perch Parkway yet and I can not promise when they will be done. We will start on them next week. If you pull your house out, you will be allowed to drive your vehicle to and from your house. If you want to fish in a portable, use a 4 wheeler or snowmobile. Do not go exploring in your vehicle. Stay on the roads. Today, I was walking about 10 yards off Lake Street and stepped into a 12 inch pile of snow, slush, and water. It is NOT all frozen. As in the past, pulling is first come/first served. Get on the list when you get up here and we will get to you as soon as possible. We have plowed the lot across the highway and lakeside, but if you want to speed the process up and cushion your pulls, please shovel the snow away from in front of your house before we get to your house. We appreciate it and it is easier on your house. It is supposed to be really nice this weekend so it would be a great time to pull your house or rent one of ours. We still have a few openings for this weekend so give us a call. Main Road and Archers Ave are open. We will try to pull some houses in Archers starting Saturday. Snow blowing on Lake Street is going well but we still have spots with thinner ice. It should firm up now that the snow is off. We hope to be pulling along Lake Street sometime next week or by the weekend. We do have a few rentals out off the end of the main road. We have a 4 hole/2 bunk and a 6 hole/4 bunk available this weekend. You will be allowed to drive your vehicle to and from your house if you choose to go into Archers. Otherwise, It is 4 wheelers or snowmobiles only.